By Melanie FerrisThere’s good reason for the strong reaction. The characters are all too real, hitting a nerve with many Aboriginal viewers. Blackstone brings to life complex individuals who struggle with internal dialogue about whether to take that next drink, how to release their haunted and dark pasts, or whether to dump that cheating yet charming jerk of a husband. I’ll admit that it’s painful to watch a performance such as that of Gail Stoney (Michelle Thrush, who won a Gemini award for her work on this role) or her now-missing friend Tracey Bull. Seeing these women drunkenly stumble through ditches, pick up random men in dive bars, and hitch a ride home to the reserve is disturbing. Many of us know an alcoholic and Thrush’s portrayal of someone suffering with the disease nailed it. Many of us are uncomfortable dealing with alcoholics in person, let alone having to watch them on TV in our downtime. By Colleen SimardBlackstone isn't for the faint of heart. The first episode alone covers corruption, alcoholism, sniffing, sexual assault and teen suicide. Swearing like a sailor also seems to be the norm on this fictional reserve. But the dialogue is also strikingly realistic; anyone who's ever spent time on the rez will see reflections of people they might even know. It's not all doom and gloom. By the second episode, the writers have thrown a taste of our sense of humour into the mix. And despite many warm reviews, Blackstone has gotten a bit of criticism. Chief Terry Nelson of Roseau River First Nation emailed a scathing review to the media condemning the series. "What will come out of the series will reinforce the stereotypes, the lazy drunken Indians, the easy women, the corrupt chiefs and councils etc.," writes Nelson. "Gordon Tootoosis' character says, 'The white people have the Mafia, we have chief and council.' The rednecks will cream themselves on that comment coming from a Cree elder." There's some truth to Nelson's statement. These characters aren't candy-coated--with a passing glance they could be seen as stereotypes. But sit down and watch the show for a while. Many of the characters are dealing with serious problems, much like the problems we all deal with in real life. This is dramatic fiction. That's what it's all about. By Maureen GoogooI’m intrigued by Blackstone for several reasons. For one thing, the show doesn’t try to pander to a non-aboriginal audience. The very raw narrative is told through the band members of Blackstone. The issues this community struggles with are internal and the community tries to deal with them internally. I believe anyone who has lived in a First Nation community in Canada can identify with the show’s characters and plot line. All of these characters have real-life counterparts in our communities. We all know someone who is struggling with alcoholism and drug addictions. We have either been directly or indirectly affected by the suicide of a friend or a loved one. We also know how ugly and stressful band politics can be. It affects entire families, not just individuals. While I’m not saying every First Nation in Canada has a corrupt chief and council, I think we all can point out bullying leaders who use their positions for personal gain and abuse their powers to silence critics. Very few journalists have been able to penetrate First Nation communities to cover these serious issues. There are many band members who will complain about corruption by their chief and council but very few of them are willing to stick out their necks to go on the record. Doing so may mean they become the targets of bullying and intimidation by those in power. As a journalist who has covered aboriginal issues in Atlantic Canada for many years, I’ve tried unsuccessfully on several occasions to get people to talk about alleged corrupt practices during band elections for news stories. They’re unwilling to go on the record because they don’t want to be seen as opponents to the elected leadership; such a designation could cost them consideration for a job interview or future housing repairs. Also, no one wants to publicly admit they have participated in an alleged vote-buying scheme. This is why I’m so envious of Blackstone’s writers for having that luxury of delving into and examining these harsh, real life issues through the fictionalized community of Blackstone and its cast of characters. They can amalgamate all of the stories of addictions, suicide, and band corruption into the storyline of Blackstone to show how people can, or cannot, cope with this type of adversity on a daily basis. The very raw and authentic themes may make some people feel uncomfortable. There has been some criticism against the show and its producers for perpetuating even more negative stereotypes of aboriginal people. For me, I applaud the show for deciding to take on the task of tackling these issues. 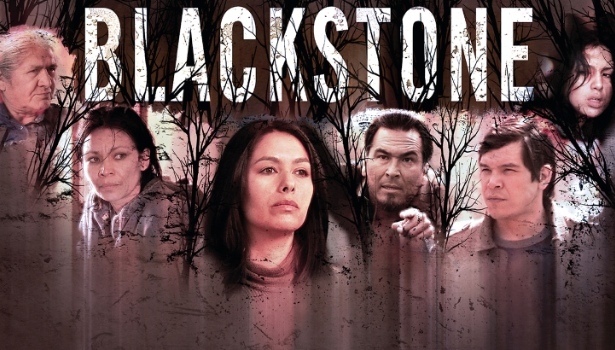 According to the show’s website, www.blackstonetheseries.com, “Blackstone is foremost a story of hope and reconciliation in its portrayal of Native people fighting for a better life in their community.”Comment: I haven't watched Blackstone yet. But it sounds a lot like the SCALPED comic book, which I've criticized repeatedly. The first question is how real are Blackstone's negative portrayals. SCALPED's portrayals seemed way over the top to me--something like 90% negative. No Native community that I've seen or read about is that dismal. Blackstone's defenders seem to be arguing that the show may be stereotypical, but it's also real. That's a dubious argument. The show is either stereotypical or real, but it's not both. If bad things happen as often in reality as they do on Blackstone, the show isn't stereotypical. For the sake of argument, let's say Blackstone isn't any worse than real rez life. The second question is whether a show this brutal helps or hurts. After watching it, do Natives actually feel a sense of hope and reconciliation? Or do they just feel upset and angry at seeing problems without solutions? And do non-Natives gain a greater understanding of and sympathy for the struggles on a reservation? Or does Blackstone merely reinforce their negative, stereotypical beliefs? I hope these aren't just rhetorical questions. Someone could do a psychological study and measure the effects of Blackstone on Native and non-Native minds. The results would be fascinating, and they might end these endless arguments. For more on Blackstone, see Blackstone Actresses Nominated for Gemini Awards and Sopranos-Style Blackstone Debuts.